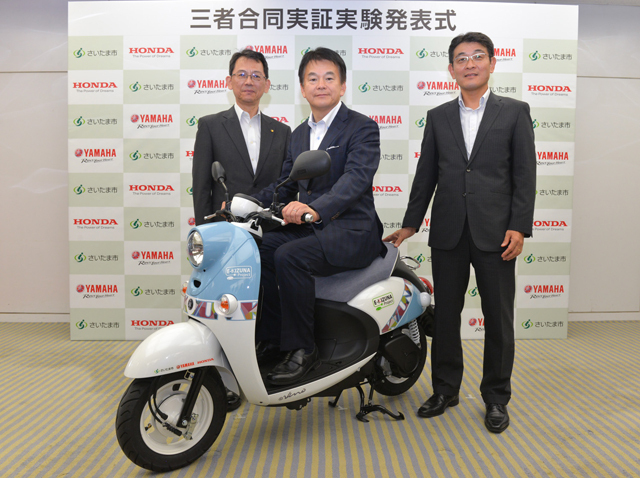 Saitama City, Honda Motor and Yamaha Motor Begin Evaluating Electric Motorcycles to Enhance Transport Accessibility - News Releases | Yamaha Motor Co., Ltd.
Saitama City (Mayor: Hayato Shimizu), Honda Motor Co., Ltd. (Headquarters: Minato, Tokyo, Japan, President: Takahiro Hachigo, hereafter “Honda”), and Yamaha Motor Co., Ltd. (Headquarters: Iwata, Shizuoka, Japan, President: Hiroyuki Yanagi, hereafter “Yamaha”) will begin evaluation testing towards the expansion of the use of electric motorcycles (hereafter “EV motorcycles”). As part of Saitama City’s “E-KIZUNA Project” measures to promote the spread of electric vehicles, this collaborative initiative by the three parties also aims to resolve the issues in areas which are lacking in transport accessibility. This evaluation testing program marks the first joint initiative between a local government body (which aims for a low-carbon society in which electric vehicles can be used in safety and comfort), and the two motorcycle manufacturers (which aim for the spread of EV motorcycles). It is an important step towards the reduction of CO2 emissions and the spread of electric motorcycles. Evaluation testing will utilize Honda and Yamaha’s electric technology and Saitama City’s existing infrastructure in order to realize a low-carbon society and verify the extent of improvement in transportation convenience in areas lacking in transport accessibility. As the next step in this evaluation testing program, an EV motorcycle sharing scheme is currently under consideration. Building on its previous initiatives towards the expansion of use of electric automobiles, Saitama City hopes that by encouraging the usage of EV motorcycles as well, this evaluation testing program will contribute towards realizing a low-carbon society in which a wide range of electric mobility options can be used in safety and comfort. Honda and Yamaha are taking this initiative so that more riders can lead more fulfilling lifestyles by experiencing the joy of travel on environmentally-friendlier EV motorcycles, and bring further vitality to the motorcycle market. 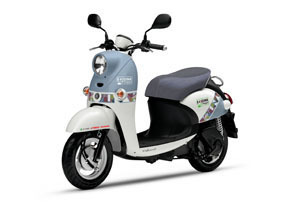 *Class-1 Category: A category defined by the Road Vehicles Act of Japan as "vehicles equipped with two or more wheels and an engine with total displacement of 50 cc or less or an electric motor with rated output of 0.60 kW or less." From left:Katsuaki Watanabe,Managing Executive Officer and Director, Yamaha Motor Co., Ltd.